The frogs of Froggy Bottom are having a race to see who is the fastest. Each frog will visit all five of his home lily pads and return to his starting place. The frog that does this first is the winner! Froggy Bottom appeared on Day 4 of the LudicAdventCalendar in 2018. More interesting than it looks at first glance. (./) (./) (./) --DavidWestbrook? Froggy Bottom received an informal honourable mention in the Changing Landscapes contest. It looked fun, and had only about a page of rules. It also had the advantage that it only needs two players, which was important the week we playtested it, and it was quick, so SeattleCosmic:AlphaTim Schutz and I played a couple of games of it. Froggy Bottom is an unassuming little game that is quite enjoyable. It's the only 2-player game in the group and is a racing game (in the game theory sense) with a memory element. It's also a quick play so it's another nice filler. As you might guess, Froggy Bottom is a race between two frogs hopping and swimming from lily pad to lily pad in a pond. The first frog to touch all of its pads and return home is the winner. As mentioned, the number on a pad determines how far you can hop from it. Aces and Nulls count as 1. 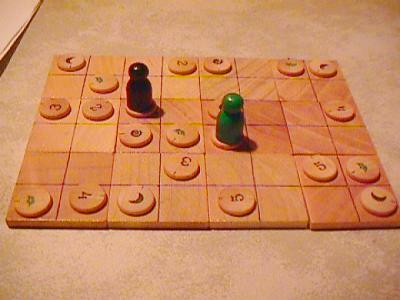 On your turn, you may either swim one space orthogonally, hop orthogonally the number of spaces on your current pad (you may "chain" a series of hops together in the same turn, but a coin must already be face-up before you hop from it), or move an empty, face-up lily pad one space orthogonally. Tim and I played our first game incorrectly. We made two errors: (1) We forgot you may hop the number of spaces on the pad you start from. (2) We forgot you may only use a number that you landed on by exact count. I won this "variant" by one move in our first game. We had a nice little contest of wills at one point in which we each wanted to score the other's lily pad, but neither would hop off first, so we just moved lily pads around for a few turns. Tim won the second game, also by one move, with a snazzy multiple jump that took him directly to his home pad. (Is "home pad" redundant?) 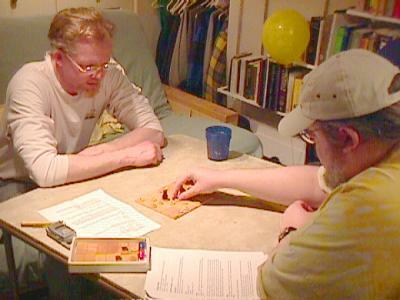 Our first game lasted about 20 minutes if you included the 10-minute setup and rules refresher. The second game was a lot closer to 10 minutes in total, since we knew what we were doing. We were also moving faster, since we were hopping the number of the pad we started on. We had thought in the first game that the placement of neutral pads meant little. However, by the second game, Tim sussed onto the idea that it's a good idea to place a neutral coin in between two of your lily pads if you can, to speed hopping between them. I suspect this contributed to his decisive multiple hop at the end of the game, while I wasted tempo.